Extron Electronics introduced the new DA HD 4K PLUS Series one input, multiple output distribution amplifiers for HDMI signals at resolutions up to 4K/60 @ 4:4:4 chroma sampling. The DA HD 4K PLUS Series are HDCP 2.2 compliant and support data rates up to 18 Gbps, HDR, Deep Color up to 12-bit, 3D, and HD lossless audio formats. They also include integrator-friendly features such as automatic input cable equalization, automatic color bit depth management, and selectable output muting via RS-232. The DA HD 4K PLUS Series distribution amplifiers are available in two, four, and six output sizes, and are ideal for applications that require the distribution of a 4K/60 HDMI source signal to multiple displays. "We are pleased to introduce the next generation of Extron HDMI distribution amplifiers, meeting the increasing need for 4K video distribution," said Casey Hall, Vice President of Worldwide Sales and Marketing for Extron. "With 18 Gbps data rate capability, the DA HD 4K PLUS series provides the performance required to distribute 4K/60 signals at 4:4:4 chroma sampling, ensuring pristine performance for the most demanding applications." To enhance and simplify integration, front panel indicators provide easy monitoring and troubleshooting. Outputs can be muted independently via RS-232, allowing content to be previewed on a local monitor. 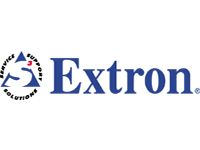 Also featured are Extron EDID Minder and Key Minder technologies to maintain continuous EDID communication between connected devices, ensuring simultaneous distribution of HDCP-encrypted source content. Each output on the DA HD 4K PLUS Series provides +5 VDC, 250 mA for powering peripheral devices.